Lichfield Civic Society was founded in 1961 as a voluntary organisation dedicated to securing the protection, preservation and character of the historic Cathedral City of Lichfield. The Society today continues to monitor and comment on developments in the City and surrounding District; liaising with the local authorities wherever possible to promote improvements to the public environment. Individual members have the benefit of free entry to our monthly speaker meetings and will also receive a monthly newsletter. 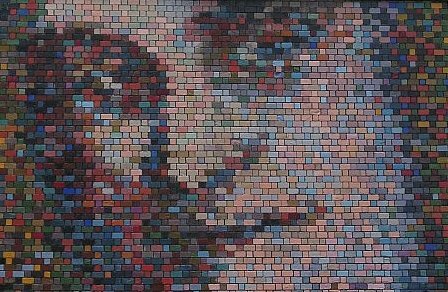 This mosaic portrait of Dr. Johnson was donated to the citizens of Lichfield by the Lichfield District Arts Association and Berger Paints in June 1976 and placed on the side of a building in Bird St. It was based on a portrait by Sir Joshua Reynolds and painted by John Myatt. www.johnmyatt.com Exposure to the elements resulted in its deterioration and the Society successfully raised funds in 2005 for its restoration and repainting by the original artist.